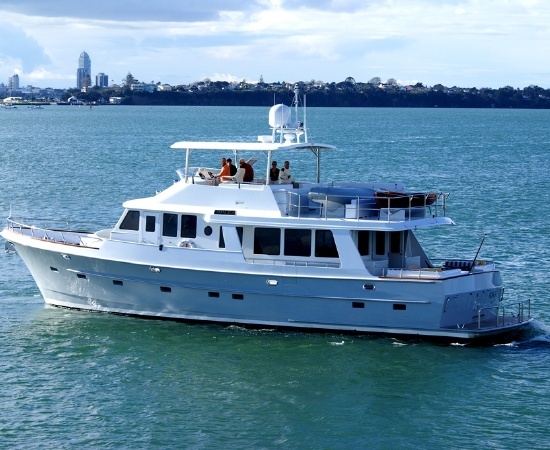 Adagio was built by Diverse in Auckland, New Zealand. The second raised pilothouse long range motor yacht Diverse has built from FMA design. The hull and deck are 5083 alloy aluminum with a custom interior by Robinson Marine of Auckland. The concept was to provide the comfort and safety of a much larger mega-yacht in a package that was easily maintained and operated by a two person crew. 72' was determined to be the most appropriate size that could cross oceans with safety and be operated with captain and mate. Adagio has a top speed of 12.5 knots and a long range cruising speed of 11.5 knots burning only 24 gallons of diesel an hour.